Want to reduce pain in your knees and be more active? Eat smarter and reduce your risk for a heart attack? Improve your flexibility and balance so you don’t fall? Sleep the entire night so you have more energy during the day? Take control of your health right now! 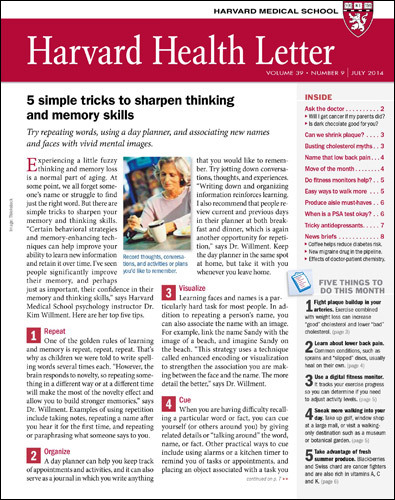 In Harvard Health Letter, you’ll find easy remedies and solutions to these common challenges and more. There’s no better time than right now to take control of your health – and you can do that with a subscription to the Harvard Health Letter. You are continually flooded with health news and have questions about where to find the best treatment, which food, supplement, or exercise is best for you, and, ultimately, what’s the right answer! With the Harvard Health Letter, from Harvard Medical School, you’ll get answers to your questions. Can exercise ward off Alzheimer’s disease? Is green tea the cancer-fighter it’s cracked up to be? Do I get the same benefit from fish oil capsules as from eating fish? At my age, should strength-training be a part of my exercise routine? Start your subscription today and be on your way to a healthier life! I Just subscribed and the Health Letter is actually wonderful. I wonder if the heartbeat letter is also accessible without paying extra. I launched a website that houses only natural and organic supplements and I think I will use the letters (with copy right reference, of course)to educate my visitors and patients. In case you are wondering the website is: http://naturganix.com which is a shortened version of "natural and organic." I wish I knew this health newsletter because I would have used it to teach my patients using the excerpts as fitting to the patient's scenario. I am a family nurse practitioner and I hope I will positively contribute to the discussion too. Thank you. Markos. I am an RN and work in TeleCare for the Veterans Administration. The information in the Harvard Health Newsletters have helped our unit by having recent, broad and comprehensive information to assist us with patient education. I believe it helps the nurses personally with our own illnesses as much as it does the vets! Thanks! Mary Ellen, Thank you for your response. It's always very nice to hear that our products, especially our health letters, are being well received among healthcare professionals around the world. Thanks so much for letting us know how we're doing, and thank you as well for the important work you're doing with America's veterans. Thank you. This publication has changed my life, for the better. From the editors of the Harvard Health Letter. The following are links to online information mentioned in past issues of Harvard Health Letter or to extra information we couldn't fit into the printed version. More on weight in old age: How is body-mass index calculated? Why is exercise protective against cancer? References for “In Brief: Low-carb dieting: Slimmer but sadder?"